The Yankees have a lot of problems to address this off-season. From the starting rotation to the horrid offense to the coaching staff, we’re probably going to see some new faces arriving in the Bronx throughout the winter months. 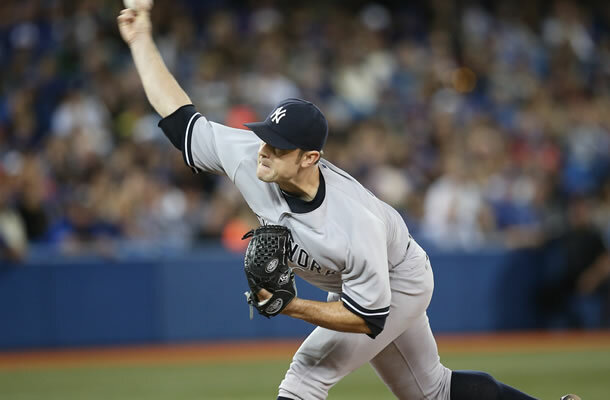 There’s one face they need to keep around though, and that’s closer David Robertson. From 1997 until 2013 (except 2012), the Yankees didn’t have to worry about who would pitch the ninth inning. Joe Torre and Joe Girardi always knew they’d be putting Mariano Rivera in to close out every big win. When “The Sandman” retired after 2013, the Yankees inserted Robertson into the role, and the team didn’t miss a beat. When Robertson was actually given save opportunity this season, he performed pretty admirably, converting 39 of his 44 save opportunities, and finishing up with a 4-5 record, a 3.08 ERA and an outstanding 96 Ks in 64.1 innings pitched. Also, let’s not forget the heroic blown save he contributed to Derek Jeter‘s incredible walk-off single in the Captain’s last game at Yankees Stadium. Not bad for one’s first go around at replacing the greatest closer in MLB history, right? Now that Robertson is a free agent, the Yankees have a big decision to make. The easiest thing to do would be for the team to extend Robertson a qualifying offer. The closer would then accept this offer, and one more year with the club. I think the Yankees would be stupid not to extend the offer. Not only is the $15.3 million a perfectly reasonable amount to pay for a top of the line closer like Robertson was in 2014, the extra year would give them time to see if Dellin Betances‘ monstrous rookie season was legitimate, and not just a fluke. The other option the team has, if they’re going to keep Robertson, is to skip the formalities of the qualifying offer and sign him to a juicy multi-year, eight figure extension right now. I’m a little torn on this one. The Yankees need to spend their money wisely this off-season. They need pitching, and they really need to do something about their offense, as well as replace Jeter. If they can afford those upgrades, and signing Robertson too, then I say go for it. Give the man whatever he wants. If signing Robertson beyond the one year qualifying deal is going to prevent the team from upgrading the offense and maintaining the pitching staff, then I think they need to see what the big kid from the Bronx can do in the ninth inning in 2015. Let’s remember that the Yankees let a top of the line closer walk away after a kid from Panama had a monster year as a setup man in 1996, and that worked out pretty well.